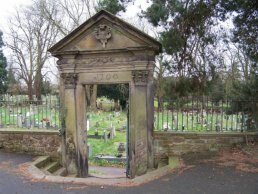 John Kyrle's Gate is a grade II listed gateway between the south side of the Prospect and church yard. 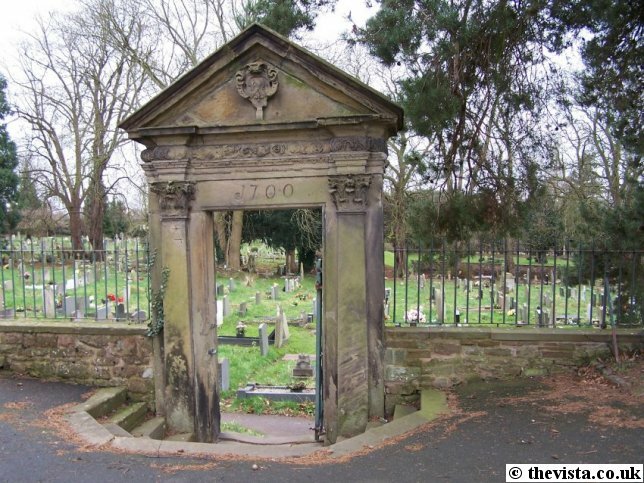 It was built by John Kyrle in 1700 and it is also known as 'Kerles' or 'Kyrles' Gateway. 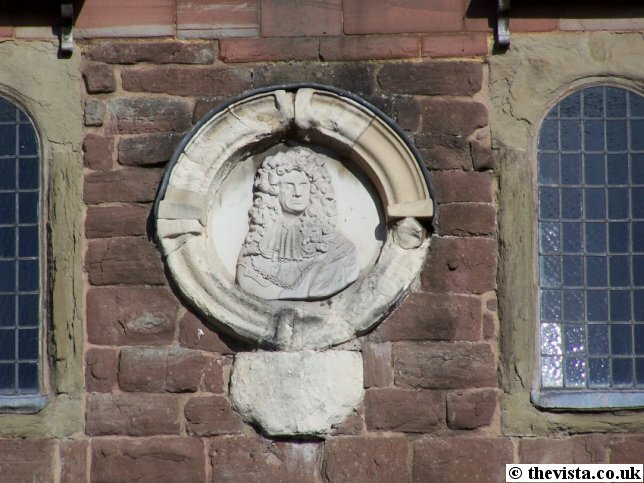 The portrait bust of Charles II in wig was originally commissioned by locals during the 1700's but it was replaced in 1959 when it crumbled away during the course of repair work in 1955. 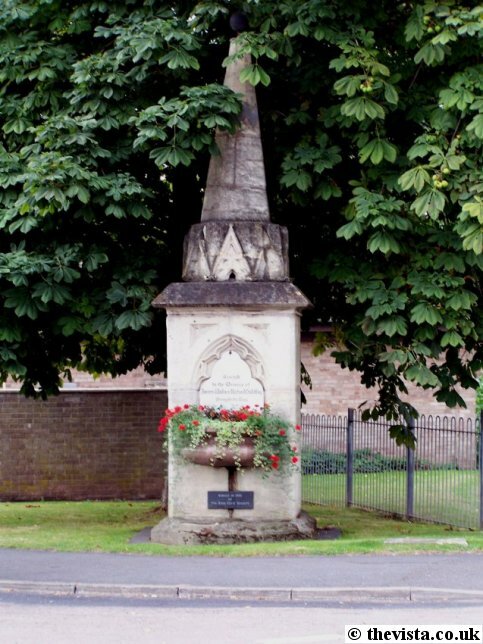 Geoffrey Gwatkin was commissioned to replace the bust and, due to the the state of the original one, based his design on various representations of the king, primarily he used the terracotta bust by John Bushnell which is in the Fitzwiiliam Museum, Cambridge. John Kyrle's Logogram is composed of the letters F and C, with a heart interlinked. 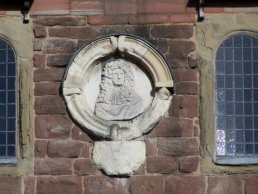 It was commissioned by John Kyrle because he could not see the bust to Charles II on the east end of the market house and apparently it means 'Faithful to Charles in heart' as John Kyrle was a committed Royalist. The Plague Cross, also known as the Corpse Cross, was erected in the church yard of St. Mary's Church in 1637 as a memorial to 315 people who died in Ross during the plague in 1637 and who were buried at night nearby without coffins. The sculptures, made by local sculptor Walenty Pytel, can be seen beside the Wye at Ross and outside the "Man of Ross" pub and were commissioned in 1997 by South Herefordshire District Council. This sculpture of The Phoenix can be found outside the Phoenix Theatre at the top of St. Mary's Street. 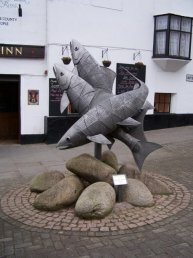 It was made by Robin Brown and was unveiled in July 2003. 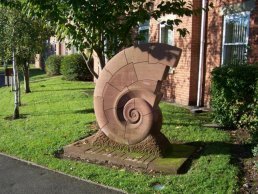 This sculpture of an ammonite in a technical drawing/model style can be seen outside the Ross Community Hospital on Alton Street. 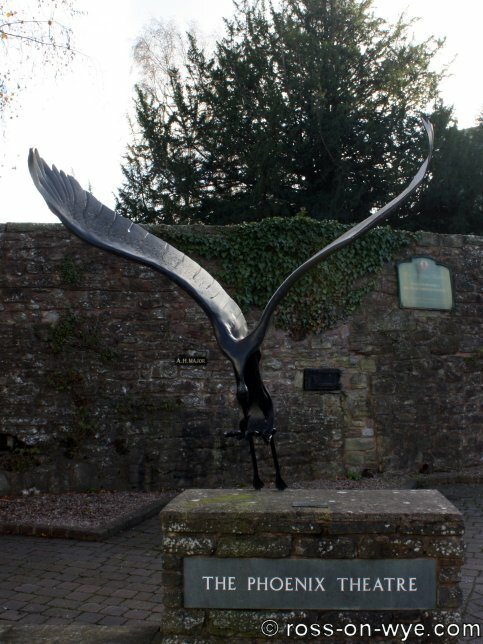 It was sculpted by Simon Thomas as part of the Ross on Wye Community Hospital Art Programme in 1999. 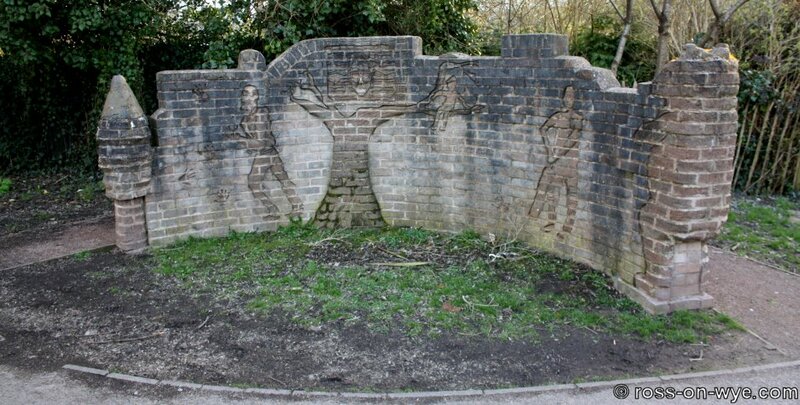 This is Dennis Potter's Memorial Wall which is outside the swimming pool. It was designed and built by staff and students from the John Kyrle High School which tries to capture some of Potter's most famous and recognisable creations in a permanent way. The wood for the Ross Wild Connections Sculpture came from one of the oak trees felled by Herefordshire Nature Trust during 2008's coppicing at Lea and Pagets Wood Nature Reserve. 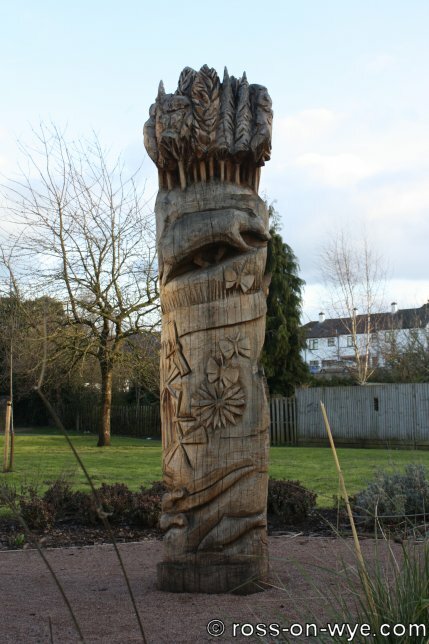 Once it had been felled, the oak tree was set in concrete so that it could be used as the basis of the sculpture1. 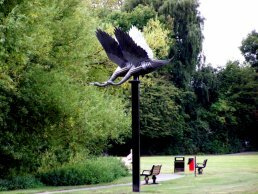 The sculpture was created as part of the Ross Wild Connections work and depicts the wildlife that lines the route of the group’s wildlife walk project. 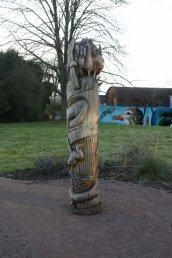 Sculptor Tom Harvey worked on the piece in situ outside the swimming pool. He used a chainsaw to start the carving and did the fine detail using hand tools. 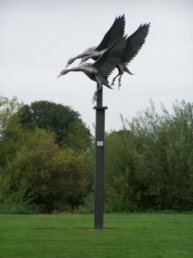 Harvey, who is also responsible for the sculpture of peregrine falcons at Symonds Yat, started work on the piece on Monday, 7th April 2008 and finished on around Friday 18 April 2008. 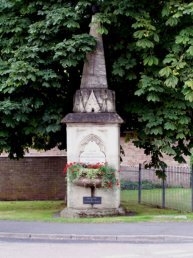 James Wallace Richard Hall was a local solicitor and banker and a major player in the creation of the Hereford, Ross and Gloucester Railway Company, and he died suddenly in 1860 and local donations were used to erect a fountain in his memory in 1860. 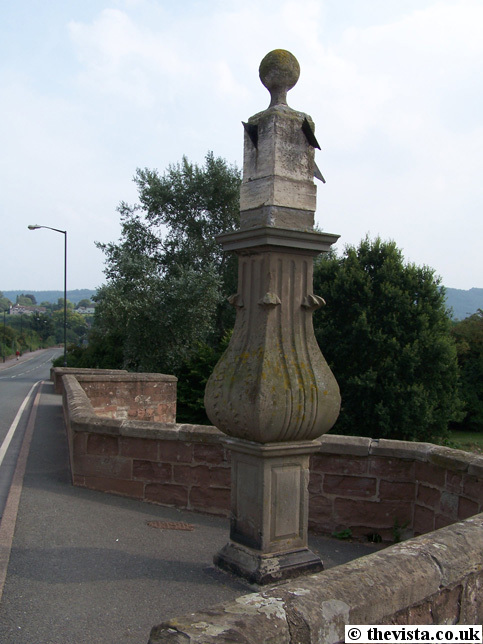 The remaining parts of the fountain are currently located on the corner of Smallbrook Road and 'Station Approach'. It was originally located on the junction of Cantilupe Road, Smallbrook Road and Station Street, close to where the roundabout is today, but had to be moved to allow improved access to the Ashburton Industrial Estate. 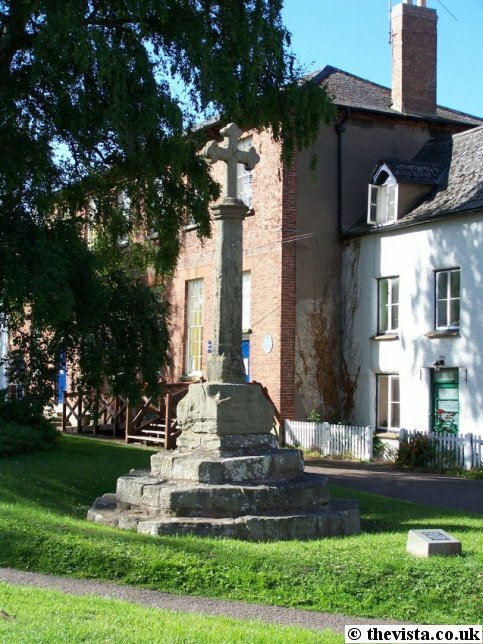 Ross-on-Wye Civic Society helped to raise funds to dismantle it in 1980 and rebuild it in 1992. 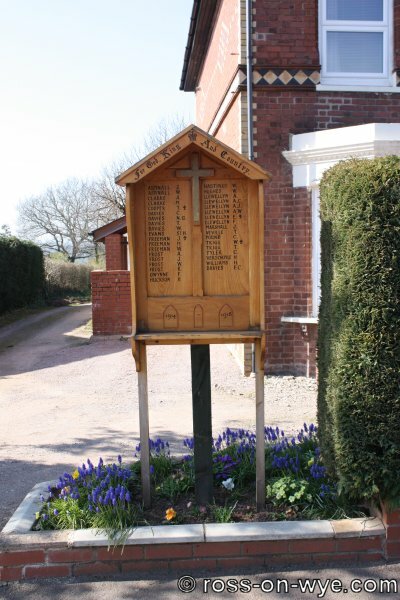 The Edde Cross Socket is built into the Blake Memorial Garden in Wye Street, and is reputedly the socket from the preaching cross that gave 'Edde Cross Street' its name. 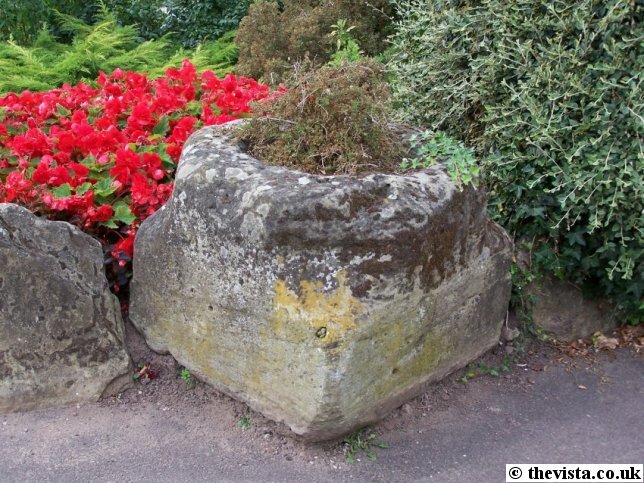 It was found at the junction between New Street and Edde Cross Street in around 1910. 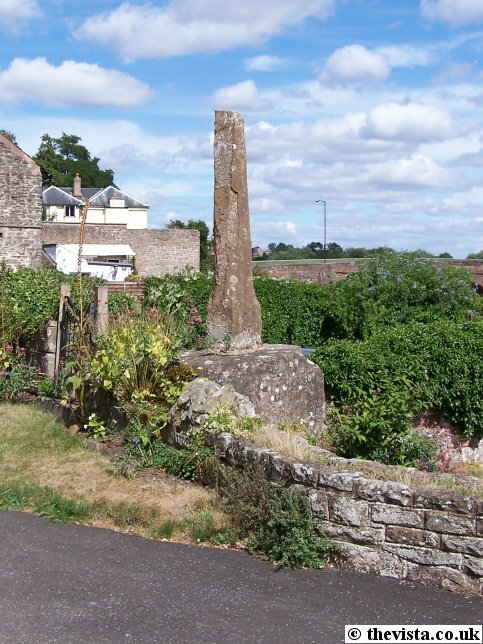 About 50 meters below Wilton Bridge, opposite the Wilton Court Hotel, are the remains of the Ferry Cross. This cross marks the site of the former ferry across the River Wye and may well have been erected to commemorate the ferry sinking although the exact reason for it is unknown. 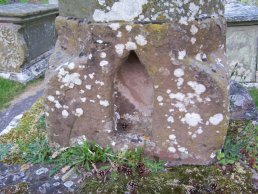 The top of the cross is now missing and only the socket stone and shaft remain. 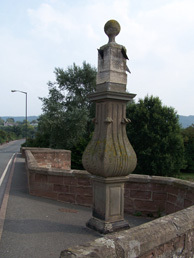 The sundial was commissioned by Jonathan Barrow of Monmouth and was added to the north side of the bridge in 1718 but was moved to its present position when the bridge was widened during the Second World War. which was where Ross County Secondary School took its motto. The sundial is unusual as it has a cube dial with four gnomons and each face is inscribed with hour lines. More details on sundials can be found at the British Sundial Society homepage. 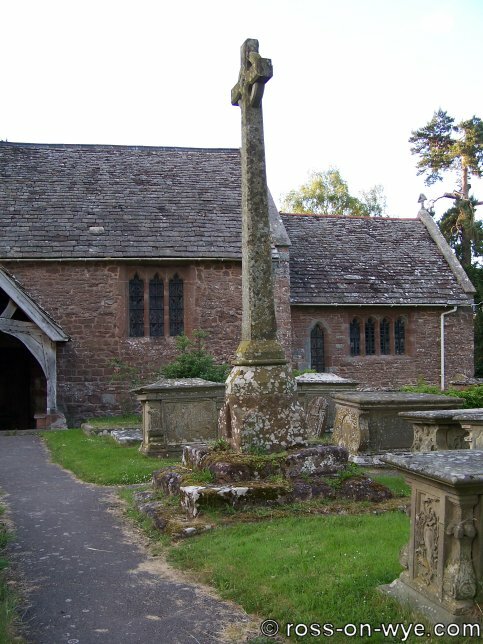 The Wayside Cross at Old Gore is a medieval socket stone to a former wayside cross. 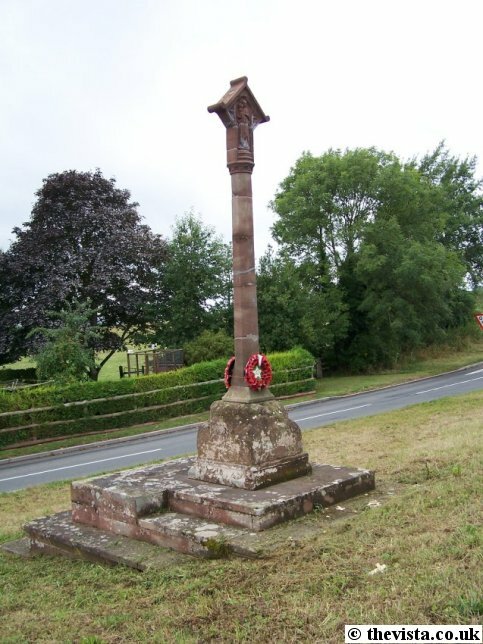 To this, has been added new steps, a shaft and a Calvary head as a war memorial. This preaching cross can be found in the Brampton Abbots church yard. 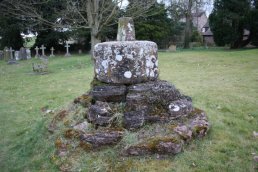 It appears to be an ancient base and socket with a newer shaft and cross in it. 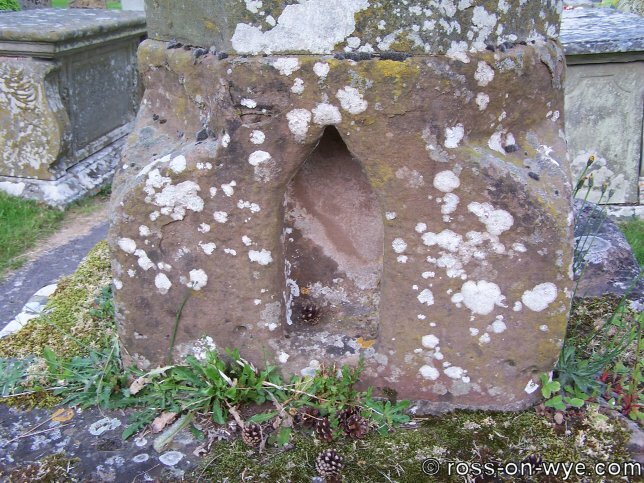 Interestingly the socket has a cut-out in it possibly for leaving items in possibly like a small shrine or similar. This socket and base of the preaching cross can be found in the Bridstow church yard. 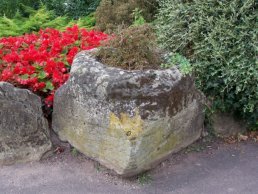 The socket is positioned on a sandstone base. It lists the names below.